In January 2013, all world customs organisations and administrations were notified of the implementation of a Certificate of Origin (CO) verification website developed by ICC WCF. 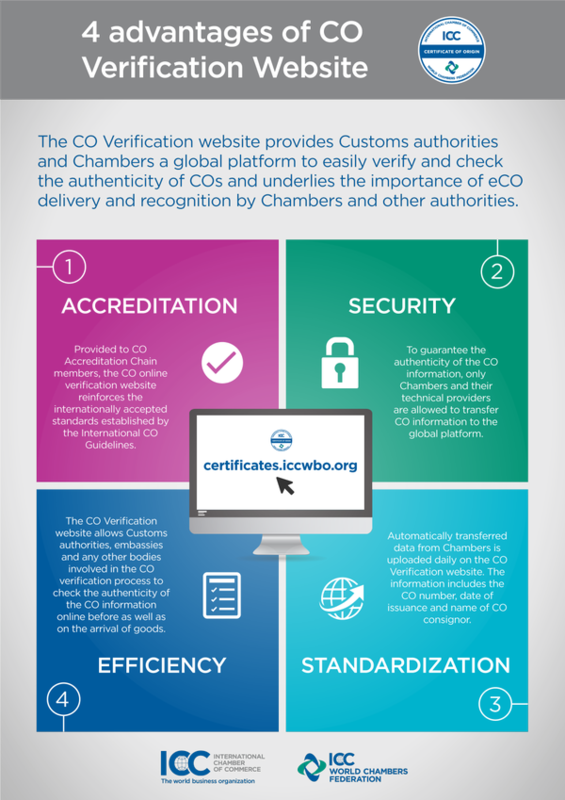 Established to support ICC WCF International CO Accreditation Chain members, the website allows customs authorities to verify the authenticity of COs issued by participating chambers. Through this secure platform, mutual trust is reinforced between customs authorities and chambers by ensuring that COs are issued in accordance with international standards. Customs authorities and chambers simply need to enter the unique CO number along with the chamber’s accreditation code into the site. This information provides access to basic references, the date of issuance and name of the applying company. The issuing chamber’s contact information is also available to customs and accredited chambers members in the event there are any legitimacy concerns. If a CO number is or not issued by an accredited chamber, an immediate notification will be sent. To authenticate a CO, customs authorities and chambers simply need to enter its unique number along with the chamber’s accreditation code into the site. This information provides access to basic references, the date of issuance and name of the applying company. The issuing chamber’s contact information is also available to customs and accredited chambers members in the event there are any legitimacy concerns. If a CO number is or not issued by an accredited chamber, an immediate notification will be sent.